When your own two feet simply will not do, you are going to need a hoverboard to get you places. This futuristic and fun mode of transportation has exploded on the market. It is quite common to see kids and adults zooming around on them. Now, most hoverboards aren’t outrageously pricey but can’t still cost a considerable amount. Still, we have managed to find the best hoverboard here. It should be noted that the balance and speeds on the cheaper models may not be as top-notch as their more expensive counterparts. 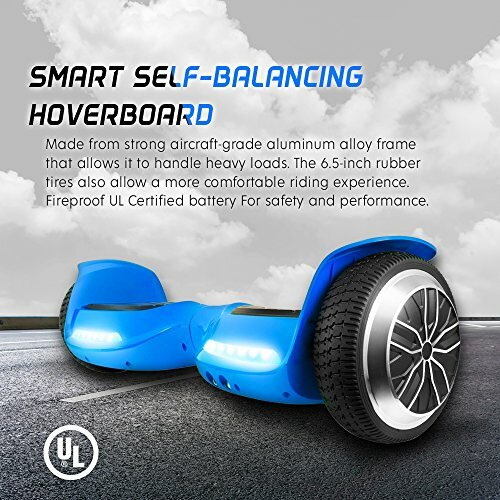 This amazing looking hoverboard is UL certified. It’s designed to look super cool with LED lights and a Bluetooth speaker. Rainbow color skins. Lunar LED. This hoverboard has a range of 10km. You can reach speeds up to 7.5mph. It’s powerful because of the dual 250W motors. The charge can last up to 3 hours. Charging time is between 2 and 3 hours. This hoverboard supports a max load of 220lbs. It’s more than enough for kids and some adults can jump on too. Using this hoverboard is just intuitive. It’s easy to learn thanks to the amazing self-balancing features. This hoverboard has 360-degree rotation. You can turn on a zero degree radius and have as much fun as you like. The board is UL 2272 certified for the battery. If you use it as instructed, it won’t explode. It is Bluetooth enabled and would connect to any other Bluetooth device in the house. It will play music, often quite loudly. The battery charger may experience some problems. Previous customers have complained about lack of durability. However, the company does replace faulty hoverboards in most cases. Overall, there’s solid value for the money. XtremepowerUS hoverboard is mesmerizingly flashy. 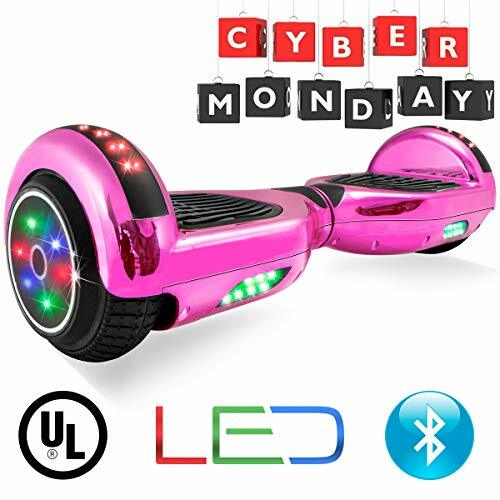 The floorboard has multiple LED lights that flash spectacularly when the hoverboard is in use. This hoverboard can rotate itself 360 degrees with the rider on it. More than a gimmick, the feature can help you turn around in a snap without resorting to inventive circular riding. The Bluetooth pairs the hoverboard with a smartphone. You can play music through the gadget when the devices are synched. The Bluetooth feature doesn’t increase functionality, but it can make your hoverboard blast music like a cool new car. 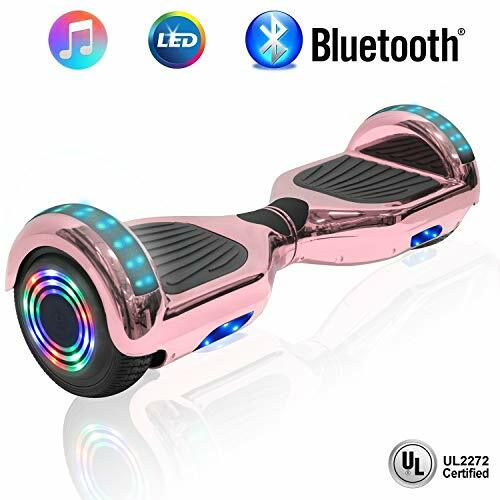 The Bluetooth device must be close to the hoverboard to work. Otherwise, it disconnects with a voice warning. The XtremepowerUS has a 4.4 Ah Lithium-ion battery inside. The battery is UL certified. It charges in about 2 or 3 hours. That’s faster than a large smartphone so it’s a great perk. The hoverboard supports a maximum load of up to 220 lbs. But the max speed is only 8 mph. The battery has been rigorously tested and is UL 2272 Certified, so as to prevent any explosions or fires. The manufacturer states that that the battery has been built according to U.S. electric safety guidelines. Moving on, the rest of the hoverboard is well-designed. It also has a relatively spacious foot area. This hoverboard is made from aircraft-grade aluminum. The material allows the hoverboard to carry heavy loads. Despite that, this hoverboard can carry only about 220 lbs max. Other sturdy hoverboards have similar max weight caps. The scooter has 6.5-inch rubber tires. Tires of this kind are relatively large and are known for tackling rough as well as exceptionally smooth surfaces. With two motors, the Levit8ion can push 14 km/hr. The distance the charge battery can run is impressively between 15 to 20 kilometers. The Bluetooth speaker connects to a smartphone so you can listen to music. The range might be an issue because the connection can drop easily. There are, of course, plenty of flashing LED lights to show off too. The Hoverheart hoverboard is definitely in the affordable range, but it’s designed with utmost care to safety. This hoverboard is made with anti-fire material for starters. The board is UL 2272 certified. It has stunning LED lights and Bluetooth connectivity. The board is painted in a dazzling metallic chrome coating. The skin looks excellent in daytime. The sturdy board supports up to 180 lbs of weight. The board has no age limit for use. The board may get stuck in the forward position. In that case, place the board on a flat surface and recalibrate. The problems are very minor with this product. It delivers excellent speed, perfectly controllable by the user. The board has a 36V / 4A battery that supports maximum speed up to 10mph. You can cover up to 8 miles on this board. The battery is highly safe, but it can take a long time to charge. It may also not be durable. This hoverboard offers supreme fun, but don’t expect impressive durability. Like most hoverboards, don’t expect the unit to last years on end. This hoverboard delivers amazing performance for the price. It’s equipped with dual motors to ensure optimal stability on the ride. The board is UL 2272 certified. It has built-in Bluetooth. You will get a 90-day warranty with this product. It’s very easy to return in case there’s a problem right out of the box. This hoverboard has 6.5-inch vacuum tires. There are LED lights embedded in the tires. The light-enabled design is quite eye catching. You can purchase the board in several designed that will surely turn eyes on the streets. As for the downsides, the lights can’t be turned off. The Bluetooth can be a bit loud too. Unfortunately, this scooter can only reach speeds up to 6 mph. You can cover up to 7.5 miles on this. Despite some of the downsides, this board is certified safe. It meets all the required fire and electrical safety standards. The built is sturdy and durable, too. You can expect the skin to last a long time. You can connect handheld devices to the hoverboard using the Bluetooth. It supports both Android and iOS devices. Overall, this is one of the better hoverboards to invest your money in. While hoverboards were initially quite pricey, there is actually a considerable selection to choose from now, even in the budget range. First and foremost, you should be concerned about your safety. This means that the hoverboard should have passed all of its safety inspections. In the United States, in particular, hoverboards must have received a safety certification UL 2272. This assures you that the hoverboard is not a fire hazard. 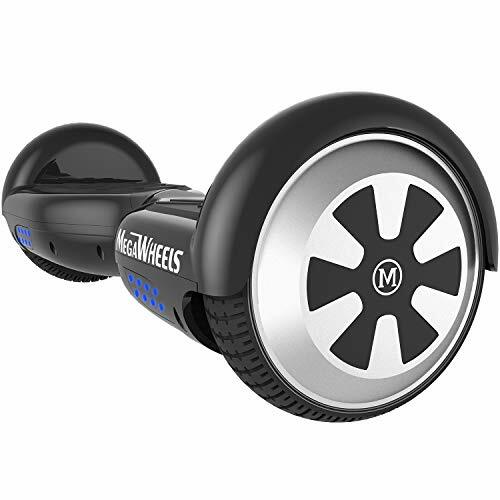 Hoverboards are all equipped with motors capable of producing a varying amount of power. It is largely up to you, the buyer, to decide what this power should be. This can be determined by looking at the top speed that a hoverboard can achieve within a certain period of time. Last but not least, you should consider the battery on the hoverboard. Just how long will you be able to use it once it has been fully charged? Furthermore, how long will the battery take to recharge? 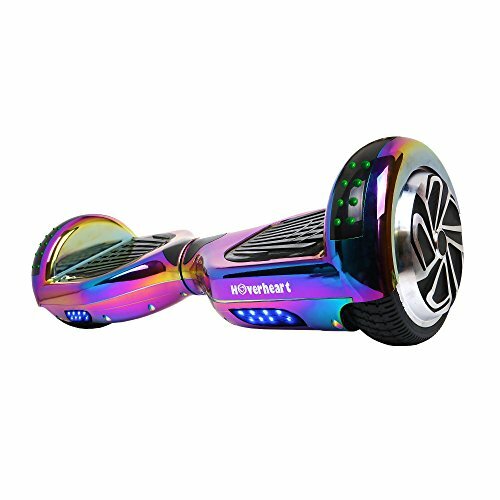 It is a good idea to look for hoverboards that have a battery indicator so that you are aware of how much charge is left. These are the top hoverboards under $200. They will allow you to experience the thrill of a hoverboard without having to break the bank.